Humanity has become profoundly disconnected from the web of life on Earth as well as from nature as a whole. 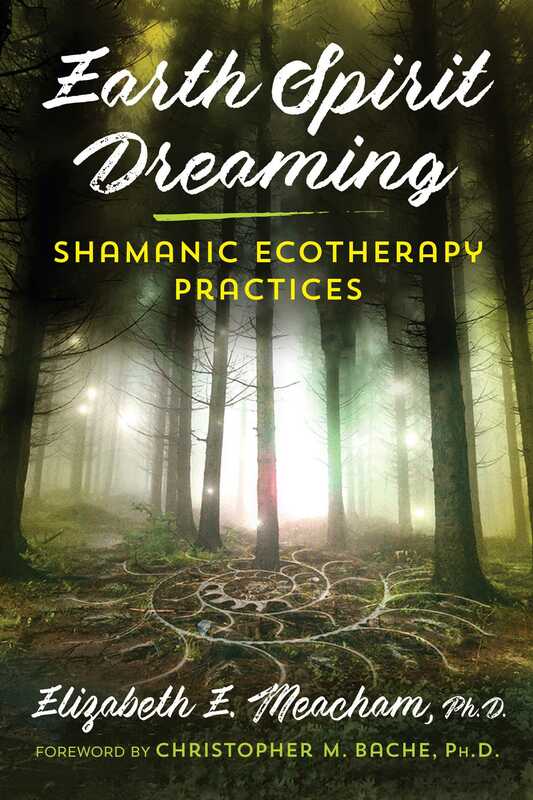 In this practical guide, Elizabeth E. Meacham details her field-tested method of shamanic ecotherapy practices to resolve this centuries-long trend toward disconnection. Through these practices, you will learn how to reconnect to Earth’s systems and help restore health and balance to people and the planet. Translating transformative ideas from visionary environmental thinkers into engaging shamanic rituals for profound spiritual growth, Meacham offers dozens of practices in three categories: Earth-connecting practices, Spirit-connecting practices, and Dream-connecting practices. Building on one another, the exercises open channels to allow you to directly experience the intelligences of the Earth and Spirit realms, rebirth your inherent shamanic abilities, realign you with the rhythms and flow of life, and reclaim your ancestral power for co-creating a healing dream for our species and all of life on our planetary home. Guiding the reader through a progressively deepening journey toward connection with ourselves, each other, and the consciousness of our biosphere, the practices also invite profound mindfulness, as we work to hold a vision of connection with the Earth and Spirit realms, while choosing consciously to focus on joy, beauty, gratitude, love, and healing. Illuminating a shamanic awakening within Western culture at the dawn of an ecological age, Earth Spirit Dreaming reveals how the birth of a global consciousness of healing depends upon our commitment to individual and collective spiritual evolution. Calling us back to our shamanic heritage of a living nature spirituality, this manual offers much needed guidance on the essential journey back to an intimate love of Earth. Through my teaching, I developed three progressive phases of practices that effectively grow Earth-connected sensitivities. While there are many different practices available to complete each step, the combination of the three steps consistently creates a shift in perspective which, while varied, produce an experience of healing and connection with the Earth. I call these three steps Earth-connecting, Spirit-connecting, and Dream-connecting. In the first step, Earth-connecting practices help readers develop an awareness of embodied connection with the Earth-community through mindfulness of our ecological context. Consistent practice of Earth-connecting practices opens doorways to what we think of in Western culture as “altered” states of consciousness, or extra-sensory perception. These states of consciousness lead to the next step in the process, which is spirit connecting. In this book, spiritual connection means experiences of being part of something larger than ourselves that take us to the level of awe. From this state of awareness, the practices in this book encourage the reader to develop a sensitivity to webs of connection perceived as subtle energies, or vibrations. Spirit can be a way of explaining an energetic, yet still normal, part of experience, rather than a different form of reality. This “spirit” realm is, in part, an expression of aliveness: a sensitivity to the energetic imprint of other beings. In the third step, the dream-connecting practices guide readers through practices that awaken the symbolic realms of experience. Dreaming, in the context of this book, can be understood as a form of visioning. Some indigenous refer to visioning, or creating reality through focusing on certain things, as dreaming. Through the dream-connecting practices, readers are invited to relate to the imaginal realms in ways that are often limited by a focus on rational thinking. The dreaming, or visioning, exercises in this book support understanding of the role of focus and creative visualization in shifting our lives and the world. A karmic eddy clearing is an artistic and imaginal meditation for clearing emotional blocks. This practice can provide respite and relief from habitual body-mind patterns. Clearing these patterns can increase healing and connection in our lives and open fresh paths of perception of the world. The idea of “karmic eddies” came to me while meditating with a river. I perceived that certain places that I go to with my body-mind energy remind me of an eddy in a river. Caused by rocks, or other formation, eddies hold water in place. Karmic eddies hold our life force in place. They are aspects of ourselves that hold our attention and are often places of learning and growth. We move our life force into the place along the path of our river of life to attend to hurts, complexities, growth opportunities, and the sacred work of our lives. Often, once the work of these eddies is done, we can form a habit of returning to them again and again, through memories, reflections, or repetitions of patterns that form our identity. While karmic eddies provide important personal and spiritual growth, it is also important to learn how to move out of them when the time comes. As I (gently) identify and remind myself to wade out of my karmic eddies for another perspective, I find myself more often experiencing the flow of a beautiful, soulful life. Swimming more freely in the river of life, I find more space each day for joy, gratitude, and magic. Begin to draw images or symbols of things in your life that feel like they take up space or pull your attention again and again. These can be good things or bad things, or somewhere in between. I usually draw the symbols in a circle as I believe circles, or mandalas, to be uniquely healing as an art form. As you draw your karmic eddies, you can include past hurts that you return to often, or attempt to keep from happening again, small and large annoyances with family members, friends, and co-workers. You can also draw habits of worry about performance, place, work, body image, and money. You might include life themes, things that you think about or have feelings about again and again. Cultivate loving kindness toward yourself as you increase recognition of the eddies and paths in the river of your life. Each represents important and sacred work during your time on Earth. You can decide when that work is done, and you can retrieve your spirit from these swirls of energy in your life whenever you are ready. When you feel that your drawing is complete, find a comfortable position for gazing softly at your karmic eddy drawing. Set an intention that you will connect with your karmic eddy drawing for healing. As you intuitively connect with your drawing, tune into the sensations in your body that may show up in connection to certain karmic eddies that you’ve identified in your drawing. Ask yourself if you may want to change it in anyway. If you feel resistance to this, don’t seek to make this change right now. Just be with the sensation. If you do feel ready to make a change, imagine a new color, temperature, shape, texture to this sensation and imagine this shift taking place. Close this meditation by opening your eyes, wiggling your toes, and tapping lightly on the top of your head. Return completely to the space that you are in and notice your surroundings. Close with gratitude to yourself and your guides for engaging this important work. Elizabeth E. Meacham, Ph.D., is an environmental philosopher, teacher, healer, spiritual mentor, and musician. She is the founder and codirector of the Lake Erie Institute for Holistic Environmental Education. Her workshops and training courses offer initiatory experiences that reflect her long-term engagement as a student of the Earth and Cosmos. She lives in Cleveland, Ohio.